Absolutely pleased with my order. Custom Earth Promos could not of done a better job for me. Thanks again. Great variety of product to choose from. Once I choose the design I wanted on this value wish kit, I had CEP customize my companies logo on the kit. Great job. I've been using this company for 4 years now and not once have I had a problem. They are always on top of their stuff and have yet to disappoint. Well done CEP. Such a large amount of different options to choose from. It really allowed me to be a creative as I wanted. Customer service was top notch. Thanks for all the help getting my order to production and delivered Custom Earth Promos was on top of it all. We hand these seed paper value wish kits at all our venues. We always get great feedback and continuously more business. Thanks Custom Earth Promos. Love the service of Custom Earth Promos. Such great service at this company. I had a lot of questions and concerns. They set my mind at ease and provided a great product. Very cool way to always be remembered. I really appreciate the 100% eco-friendly aspect that comes along with the seed paper value wish kit. A cool earth-conscience way to impress. Great color on the finished product. Everything looked great. Customer service was top notch. Thanks for all the help getting my order to production and delivered. I customized these seed paper wish kits for my daughters birthday. It was a great way to instill memories and comradely amongst all the kids. I customized the seed value wish kit for my best friends wedding. They really got everyone to interact and created some great memories. Cool idea, being Eco-friendly and building memories all at the same time. My clients really appreciated the seed paper wish kit. I liked that I could help the going green cause too. 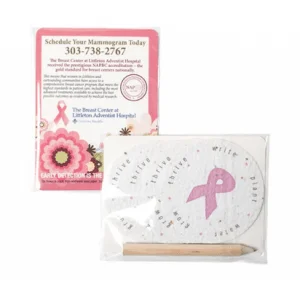 Seed Paper Value Wish Kits from Custom Earth Promos are an affordable and highly effective eco-friendly promotional tool. Our seed paper wish kits simultaneously promote the positive social and environmental initiatives of your brand. Customize the 100% recycled 3" W x 4" H cardstock backer and 2.6" seed paper circles to display your brand name, logo, custom message or environmental initiative. Orders of over 2,500 will also include a custom designed pencil. Orders include full-color printing on one side. Use seed paper wish kits as a team building activity among employees. Send them to loyal customers as a bonus incentive thanking them for their continued business. Trying to woo a potential client? Send them a brand exclusive eco-friendly wish kit that speaks to both your social and environmental brand merits. These creative and inspiring wish kits will bring the dreams of your customers, employees or event guests to life and stand as a living testament to your admirable brand values. Consumers are placing more of their buying decisions in the social and environmental standards of the brands in competition for their business. "The Big Green Opportunity" survey reports growth rates for green business products and services are rising faster than conventional goods in America's economy. Brands with strongly established sustainable production methods, green products, and social value outpaced the overall economy through the depths of the Great Recession and is creating a great opportunity for 88% of US "microbusinesses" of five or fewer people. Due to the spiking growth and consumer demand for "green" products and ethical standards of brands, larger corporations are feeling the heat of competition from the eco-friendly small businesses that have effectively communicated stronger core values. Consumers are giving their business to the brands that exhibit the most positive social and environmental impact, making it necessary for businesses of all sizes and serving all sectors to invest in their brand image in order to stay competitive in the current market. Our Seed Paper Value Wish Kits are a perfect strategy for promoting your eco-friendly and socially responsible brand image. Inspiring and memorable, your guests write their dreams on the enclosed seed paper circles and plant them under a thin layer of soil. With adequate watering and care, the wildflowers of their hopes and dreams will sprout in just 1-3 weeks. By planting their dreams with the eco-friendly medium of your brand, a lasting bond is formed with customers, employees or event attendees. This living testament to your eco-ethical brand will serve to increase brand trust and word-of-mouth advertising. Invest in the eco-friendly value of your brand to secure long-term profitability and higher market share value. Our Seed Paper Value Wish Kits are an affordable, eco-friendly and fully customizable way to promote morale among team members and publicize eco-friendly value to customers and prospects. Kits include a full-color, custom-printed (1 or 2 sided), 100% recycled 3" x 4" cardstock backer card with rounded edges and a biodegradable cellophane bag. 4 2.6" diameter seed paper circles and a pencil sit inside the cellophane bag, supported by the cardstock backer. You'll work directly with a Custom Earth Promos in-house design expert to build an exclusive design blueprint that best captures the aesthetic of your event, brand or a specific campaign. Our seed paper is the best in the industry, renowned for its rich quality texture and high yielding results. We hand make our seed paper in the USA, using only the highest germination rate, USDA-approved, non-GMO seeds to guarantee growth in any US Climate Zone. Only all-natural, soy-based pigments are used to color seed paper and render custom graphics. Our proprietary production and printing process is carefully monitored to ensure maintained seed integrity. 100% recycled from post-consumer materials, our seed paper is infused with a hardy blend of wildflower seeds that are guaranteed to grow in just 1-3 weeks after planting with a little soil and water. Letterpress printing provides an option to stamp an embossed image of your logo or custom design directly onto seed paper. In a time-crunch, offset printing can be used to have your custom order of wish kits delivered just 5-7 days after design approval. Your design expert will ask about the design goals, quantity, and potential time restraints to create an exclusive order that best reflects your brand or current campaign. We can even apply a custom seed mix, infusing your seed paper with a specialty, seasonal or exclusively designed seed blend that specifically complements your design. Just ask your expert which custom seed mixes are available!